Venthaya dosai or methi dosa is soft and spongy on one side and crisp on the other side. It has a unique taste and subtle flavor of fenugreek. Just give it a try! Note: Ingredients mentioned here make approximately 20 dosas. 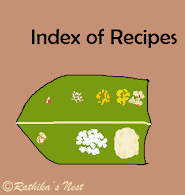 However, the number of dosas depends on the dosa tava you use and size of the dosas you make. How to prepare the batter: Wash and soak par-boiled rice, urad dhal and methi seeds in sufficient water for 4-5 hours. Grind them together into a smooth thick paste preferably using a wet grinder. Add salt and mix well. Allow the batter to stand overnight or at least eight hours. Next morning, mix the batter well. Add water to make the batter into pouring consistency. You may refrigerate the batter and use it to make dosa as needed. How to prepare dosa: Mix the batter well before using. Heat the dosa tava on medium flame. Once heated, spread the batter evenly on the tava to make the dosa slightly thick. Add sesame oil around the dosa and cover with a lid. Allow it to cook for a minute. Once done, open the lid and remove dosa with a dosa spatula. You NEED NOT turn the dosa and cook the other side. The top surface of the dosa gets cooked under the lid. Venthaya dosa is crisp on one side and soft on the other side. Serve hot with chutney or sambar.